Our Mother’s Home is pleased to announce that Carmelina Gomez and Julie Kuhns have been named the 2013 Graduate of the Year and Mother of the Year, respectively. These outstanding women will be officially recognized during the 4th Annual Hearts of Love Gala, the organization’s major fundraising event, on February 22. The Graduate of the Year award recognizes the achievements of a young woman who has successfully completed her journey at Our Mother’s Home and serves as an inspiration to others. Mother of the Year is awarded to a dedicated volunteer who has gone above and beyond to help provide teen moms a safe and loving home where they can learn to love and respect themselves and their children, as well as the resources to become self-sufficient, productive members of society. Teen moms at Our Mother’s Home are in the foster care system or victims of human trafficking or other traumas. Together, the awardees’ stories demonstrate the healing power of a lasting mentoring relationship. Carmelina came to the United States from Guatemala at the age of 14, leaving her parents and siblings behind. She believed she was on her way to a better life. Instead, she found herself subjected to repeated trauma. “It’s been a difficult journey for her to get to where she is,” confirmed Karen Watson, executive director of Our Mother’s Home. 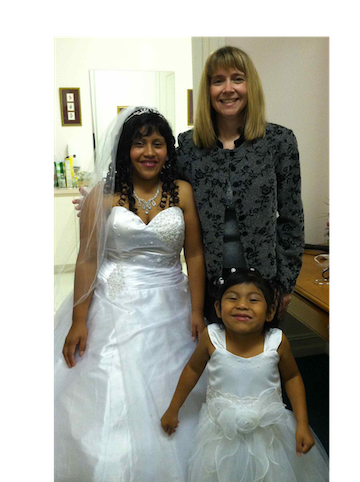 Today, Carmelina is a young married mother of three beautiful, loved, happy children. She and her children are in school and she plans to continue her education after high school. “Without Our Mother’s home, I would be lost,” she said. Much of her progress has been made with the help of her mentor, Julie Kuhns. In 2011 Carmelina turned 18 and had to leave Our Mother’s Home, as mandated by Florida law. She was alone and scared. However, Julie began volunteering for the organization around the same time. It was the beginning of a friendship that grows stronger today. Much of their shared lives center around Cypress Lake Methodist Church, where Carmelina joined Julie as a member. The two attend services together every Sunday. Carmelina had her children Diego and Angelina baptized at the church. She also got married there, with Julie’s mom, “Grandma Janet,” walking her down the aisle. The baby shower for the youngest child, Freddie, was held at the church, too. Julie even had the privilege of being in the delivery room when he was born. Julie Kuhns is a Licensed Clinical Social Worker in private practice at Psychiatric Associates of Southwest Florida, and also serves as adjunct faculty in the College of Health Professions and Social work at FGCU. She is married to David Moulton and they have a 16-year-old daughter, Melissa. They consider Carmelina and her kids part of their family, too. Watson said Julie’s dedication is an inspiration and added, “This story demonstrates how successful a mentoring program can be.” Watson also indicated that Our Mother’s Home has a continual need for more mentors who are non-judgmental and willing to be there for their mentees in good times and bad. Proceeds from the 4th Annual Hearts of Love Gala: Our Hearts are Soaring will help Our Mother’s Home continue to provide vital services to foster teens and human trafficking victims who want to keep and raise their children in a supportive environment. The event will offer the Southwest Florida community an opportunity to enjoy a night of entertainment, while supporting Our Mother’s Home as they work toward making a positive impact in the lives of teen mothers who are in the foster care system or victims of human trafficking. The gala takes place at 6 p.m. on Saturday, February 22nd at the Sanibel Harbour Marriott Resort and Spa, 17260 Point Drive, Fort Myers. NBC-2’s Krista Fogelsong will be the Master of Ceremonies for this event, which will feature a breathtaking tight rope act by Tino Wallenda of The Flying Wallendas, an hour of hors d’oeuvres and an open bar, a 3-course dinner with wine, and live auctions, followed by music and dancing. Seating is limited – buy your tickets today! A few sponsorships and advertising opportunities are still available as well. For tickets or information on sponsorship and advertising opportunities, visit http://www.ourmothershome.com or call 239-267-4663. Our Mother’s Home of Southwest Florida is a non-profit organization that aims to break the cycle of foster care and generational poverty by providing teen mothers, ages 12-18, who are in the foster care system or victims of human trafficking and other traumas, with a safe and nurturing home where they can learn to love and care for themselves and their children, while becoming productive members of society. As a privatized 501(c)3 organization, Our Mother’s Home raises 50 – 60% of its own funding to provide teen mothers with a supportive environment to stay with their children, learn life skills, and finish their education through its Mentored Living Program. There are no federal, state or city funding provided for the infants of the teen mothers. They depend heavily on dedicated volunteers and contributions of funds, commodities and services. With over 200 mothers and children being helped over its 13 years of operation, Our Mother’s Home continues to be a model for success in decreasing the rate of children in foster care. For more information, call (239) 267-4663, email info@ourmothershome.com, or visit http://www.ourmothershome.com.